More of us than ever before live and work in cities. 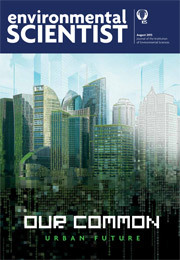 This issue of the environmental SCIENTIST seeks to address some of the questions that arise around our common urban future. Articles draw on work from across the environmental sciences, exploring the challenges that cities will face over the coming decades, and the exciting and innovative environmental solutions and projects being undertaken to improve our urban areas.